Kayaking big water had not gone well for me three years ago. Loosing my kayak and paddle and barley managing to climb along the wall of the canyon to safety was still fresh in my mind. There was very little to consider around weather I should join a two week rafting trip. What was giving me serious pause was whether to raft or put my big boy trousers on and again, kayak big water. The trip already had two kayakers and three rafters. If I rafted i would be a passenger. A hard thing for a former raft guide to do. We tend to want to steer. So I decided to kayak but promised myself that I could walk around the big stuff. 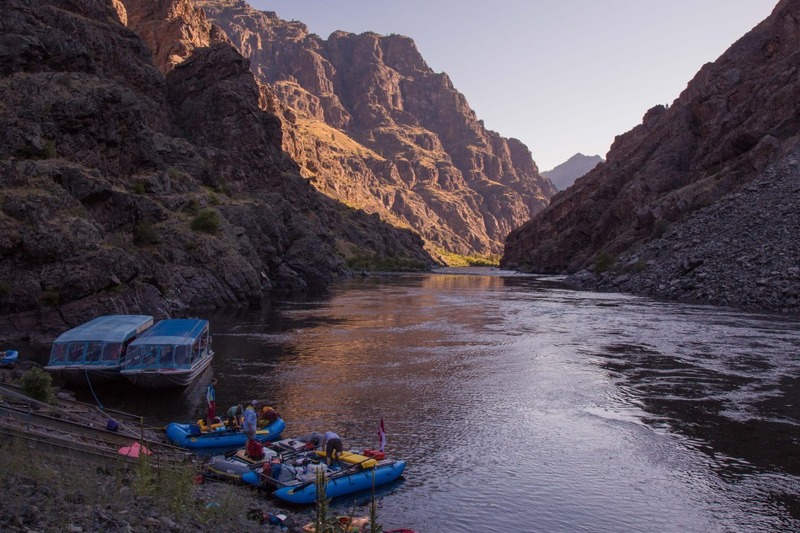 Hells canyon is the deepest gorge in North America. Deeper than the grand canyon. Deeper at 2,436m than the Mt Kosioskio, Australia’s highest point. In fact it felt very much as if the river wound its way between two imposing mountain ranges. We rigged our rafts in the shadow its hydro dam and swapped stories with the commercial rafters preparing for their launch. It always pays to ask a local. Learning about the poison ivy, a common and nasty little plant was particularly useful. Still managed to walk through plenty, but it could have been worse. We could see the first rapids from the put in. The longer you stare at a water feature the more you start to question yourself. So it was with some small relief that we set off. The three kayaks heading out ahead of the bulky rafts. Paddling out to the middle of the wide river so far beneath the canyon peaks we all felt quite small indeed. The trick we soon found was to stay in the middle of the main current and away from the edges where strong boils and eddy lines could cause smaller craft serious trouble. The rapids and whirlpools on the side looked intimidatingly large but The first few kilometers passed quickly and we became more comfortable in the larger water. It was not long before we spotted the first of the larger rapids. Pulling the boats to the river side we walked up the banks to scout. Sure that I would be walking around. Looking down however I was struck by how easy it looked. To be sure there were plenty of places where you would just not want to be. But a clear line of untroubled current stretched through large standing waves. It was a matter of putting yourself in the right place and hanging on. Jeff and I were soon pulling away from the shore, me following Jeff into the large water rapid. I felt very small. The safety of the shore might as well have been light years away . The canyon walls towered over us. Everything looks bigger from your boat and the large rapids we scouted were monstrous now they were up close. Not that we got that much time to look, the current sped us through at a blurring pace. We held on enjoying the rush. The rafters described watching us like watching corks from a bottle. Afterwards I was told that that was the largest of the rapids. For the first time I was actually confident that I would be able to paddle the whole river without walking a single rapid. I would not call the river busy but it was certainly more populated than our group was used to. Not just other rafters and families but with motor boats travelling up and down the rapids both private and tourist. The atmosphere was almost like a beach party. There were plenty of beach camp sites each day to choose from. Our rest day camp was particularly picturesque. To my delight the rest of the rapids were much the same as the first. Imposing but with large channels through them. As long as you put yourself in the right place it was like being on a watery roller coaster. By the end of the trip I had kayaked all rapids and satisfyingly rolled once.